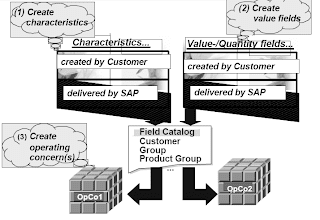 SAP Controlling Structures deals with the flow of information in the SAP Module.It has the following Organizational Units.The operating concern is the highest reporting level within CO-PA; it defines the limit of sales and marketing information which can be reported together from this module. One or more controlling areas are assigned to an operating concern when organizational structures are defined. 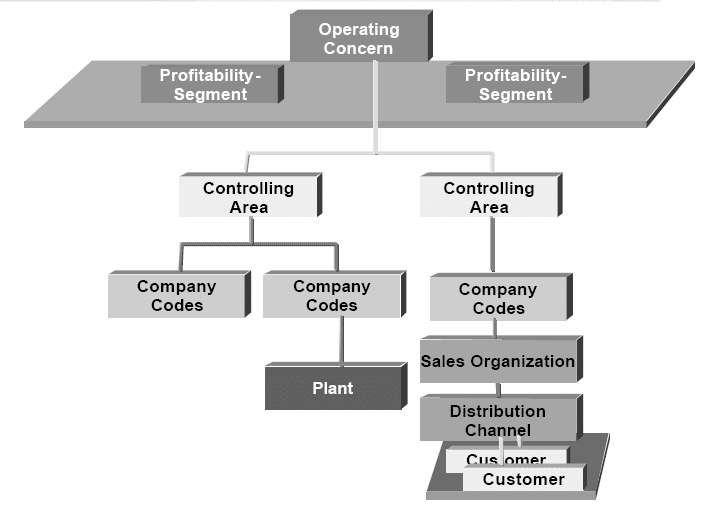 Often, corporations have only a single operating concern, which is recommended for the sake of simplicity and convenience if all controlling areas and company codes share the same fiscal calendar.The controlling area is an organizational unit delimiting the organization's independent cost accounting operations (cost center accounting, profit center accounting, and order accounting)company codes are assigned to controlling areas when organizational structures are defined. Often, a 1:1 relationship exists between the company code and the controlling area. However, a controlling area can also incorporate several company codes to take cross-company cost allocations into account.The company code is an independent accounting unit within a client. The legal requirements of a balance sheet or profit and loss statement are fulfilled on the company code level. 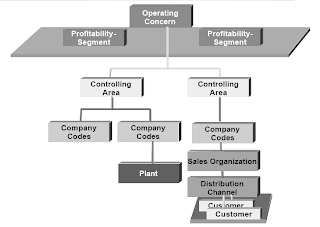 Plants are assigned to company codes when organizational structures are defined.The plant represents a production facility. It is the primary organizational unit in the SAP R/3 Materials Management and Production Planning application components. Answers the question: "What do I want to report on?" Answers the question: "What values can I have for these characteristics?" Answers the question: "What is the technical definition of my sales channel?" Answers the question: "What performance measures do I want to track and analyze?" Characteristics are the analysis dimensions for CO-PA. They define what items or objects the user will be able to analyze. They determine the technical specifications of a sales channel definition. Several essential and obvious characteristics (like "sales organization"," customer", "product", etc.) are pre-defined automatically for every operating concern; these are known as fixed characteristics. In addition to the fixed characteristics, up to 50 non-fixed characteristics can be added to an operating concern. Often, only 10 to 20 of these are required to meet most companies' reporting needs. Each characteristic potentially has a check table behind it which carries the characteristic values which are valid for CO-PA; this helps to validate the data flowing into CO-PA.When creating a new characteristic independently in the field catalog, it is possible to choose whether the system should generate a check table for it or not. It is not necessary to create value fields for calculated items, such as net sales, contribution margin, etc. These items are normally calculated from the base values stored in the value fields during the report execution progress (to minimize necessary data storage requirements).Fixed Basic Key Figures (Account-Based CO-PA only)  In account-based Profitability Analysis, all values are updated to accounts. Each amount is stored in up to 3 different currencies under fixed basic key figures, which are accessed in reporting. You define the structure of your operating concern when you set up your system. This is done by selecting the characteristics you want to use in the data structures of the operating concern.In costing-based Profitability Analysis, you also need to select the value fields you want to use.The structure of an operating concern is valid in all clients. The attributes are client-specific parameters of an operating concern. They have different effects depending on the type of Profitability Analysis you are working in. Operating concern currency In costing-based Profitability Analysis, actual data is always updated in the operating concern currency. You can change the operating concern currency as long as no data has been posted in the operating concern. Company code currency In addition to the operating concern currency, you have the option of storing all data in the currency of the relevant company code as well. This makes sense if your organization operates internationally and deals with exchange rates that change daily. It allows you to avoid differences due to different exchange rates and lets you reconcile your CO-PA data directly with FI. Profit center valuation In addition to storing data in these two currencies using the legal (= company code) valuation view, you can also store data in both of these currencies valuated from the viewpoint of individual profit centers. The fiscal year variant determines the number of posting periods per fiscal year. Since each controlling area assigned to the operating concern -- and each company code assigned to each of those controlling areas -- can have its own fiscal year variant, the variant you choose for the operating concern must agree with that for the other areas. In costing-based CO-PA, all amounts are stored at minimum in an operating concern currency, which is specified in the operating concern attributes.It is also possible to configure the attributes to store values in the local currency as well. This has the effect of doubling the stored transaction data, though.Even if all amounts are stored only in the operating concern currency, it is possible to report using other currencies. However, reporting translation is only possible using period-average translation rates.Account-based CO-PA always stores data in three currencies: Transaction, Company Code and Controlling Area currency.